All of the seasons have their appeal: for me Autumn is a kind of grand finale before the frost and dark close everything down for winter. The Equinox has passed and the evenings are rapidly drawing in. The ‘season of mists and mellow fruitfulness’ is here, although outside a chilly young gale is already blowing, teasing and testing the finery of the turning trees. Red, yellow and gold are for a brief time replacing a rather weary green, before the last leaves’ ‘light footfalls’ are heard. The swallows have flown, but meanwhile the blackbirds have nearly finished the rowan berries. Flocks of starlings are milling madly above the hedgerows, a noisy murmur of greater things to come. Some late-flying insects get what they can from the few remaining flowers. Seed heads burst with food and new life. Berries burn bright in the hedge. 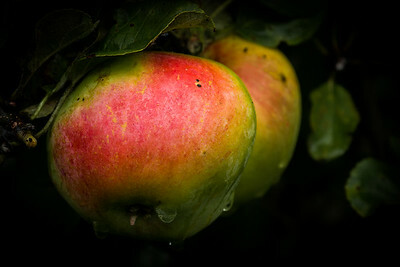 Our own crop of apples is ready to pick and it is time to put the garden to bed for the winter. But before I can even reach for my wellies the rain starts again, a persistent and discouraging patter. 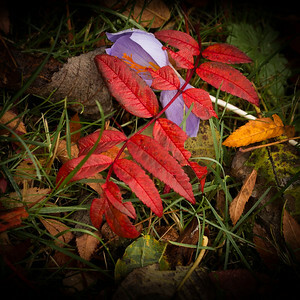 Click on a picture to visit my Autumn Almanac Gallery. And if you like what you see, share it with your friends, they might like it too!